You shouldn’t turn your CRM system into the Robinson Crusoe of your business. Each piece of software you have is powerful in its own right and serves a critical purpose. But keeping them separate only hinders how effective your organization can be. Thanks to integration, however, your systems become more than the sum of their parts and create a centralized, cohesive unit. What Is CRM Integration and Why Should You Care? Before we launch into the juicy details, let’s take a step back and look at what CRM integration means for your business. The simple version is that your CRM won’t exist in a vacuum. Integration acts like the interstate highways that connect major cities here in the U.S, allowing traffic to flow from one hub to another. Integrating a CRM application with other software brings the same result. The more systems you connect, the more streamlined your activities will be. And with your CRM integrated with other applications, you’ll gain a more unified view of your business. Such full visibility fosters better decision-making and enhances business strategy. Now it’s time to explore some of the top CRM software integrations and how they’ll contribute to your company’s success. It’s not surprising that customer relationship management is a highly popular software category. After all, every business has customers (or if it doesn’t, hello bankruptcy). So no matter what industry your business is in, integrating your CRM is something you shouldn’t ignore. Let’s start with the most obvious choice: marketing automation. There’s a reason it’s common for companies to integrate their CRM and marketing automation. It’s so darn effective. There’s no longer the laborious manual work of transferring relevant information between them. The systems work in sync, removing data silos and allowing your teams to be more effective and productive. What department can you think of that doesn’t like streamlining their resources as much as possible? Yep, it’s a short (aka nonexistent) list. Connecting your customer relationship management and marketing automation tools is even more beneficial when you have multiple marketing automation platforms. For example, a standard solution and an email marketing software such as Constant Contact. CRM and marketing automation go together like peanut butter and jelly. Their features are complimentary, not redundant. These two systems help not only your marketing department, but also your sales department, manage customers and leads. A CRM application keeps track of conversations and contacts with your customers and leads. Meanwhile, marketing automation software records how those customers and leads behave in relation to your content. Used together, however, the systems optimize each other’s capabilities. When leads open and click specific marketing emails, the system automatically records that data in both the CRM and marketing automation database. No longer do your sales people have to go to your marketers to get information on how qualified specific leads are. They can simply check the CRM information sent over by the marketing automation software. Qualifying leads doesn’t get much easier than that. CRM applications create a lot of data. In our data-driven world, that’s great. But all that data comes neatly packaged with a warning sign. They’re excellent tools for managing customer and lead data for sales people and marketers alike. But, when it comes to analyzing the data, they’re a prep student out in the Canadian wilderness — lost. Just because CRMs know how to churn out customer information like the tech equivalent of a car assembly line doesn’t mean they help you analyze it effectively. The good news is, for pretty much any problem a modern business faces, there’s a tool for that. And the realm of data analysis is no exception. In fact, analyzing data is the bread and butter of business intelligence. I’ll spare you a long spiel about the importance of using data — no point preaching to the choir. But integrating your CRM with a BI solution makes data analysis a whole lot easier. BI tools make it easy to visualize and analyze data. What do you get once you connect the applications? Although you could analyze your CRM data without integrating it into your BI solution, it’d take a whole lot longer. Doing so would involve manually entering all the data into the BI system, whereas integration automatically shares your CRM data with the BI for analysis. What would manually take upwards of several hours instead takes seconds. Pretty sure that’ll make your boss happier and your life way more productive. Integrating your CRM and ERP is another common business practice — and for good reason. ERPs centralize software for companies, making everything accessible for everybody. The customer data stored in a CRM database is some of the most important data to a company, especially when said company is trying to grow. Therefore, this data should be easy to access for whoever needs it. Nick Ismail at Information Age pointed out some of the advantages companies that integrate their CRM and ERP have over ones that don’t. First and foremost is the elimination of data entry and duplication. Combining your ERP and CRM creates a shared database, which gets rid of manually entering data into a system. A benefit that’s not as well known, however, is that you avoid data duplication. When you have separate databases in a CRM and ERP, you’ll always run the high risk of coming across the same data points. After integration, however, the two systems automatically share data, so you never have to deal with duplicated (aka bad) data. Ismail also discussed how CRM and ERP integration creates a more holistic view of your customers. A lone CRM provides the frontend information, such as sales and support history. 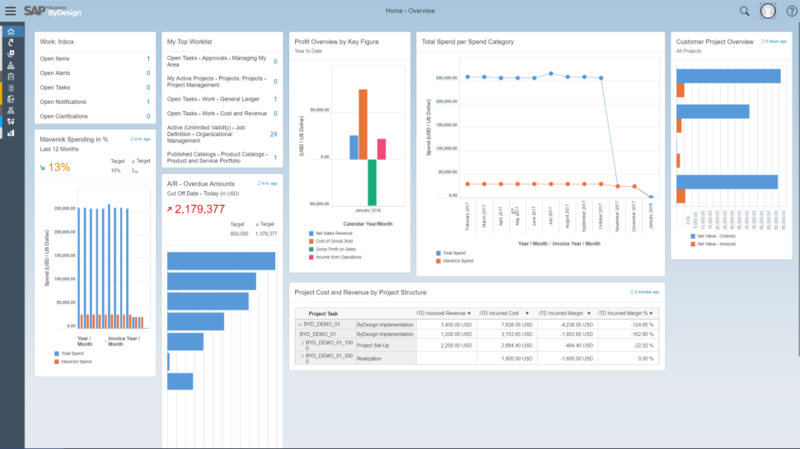 But it doesn’t include a window into the backend information shown by an ERP — things like finance and invoice history. Letting your ERP and CRM “talk” to each other gives you a comprehensive, single customer view. You can then use this additional information to discover insights you wouldn’t otherwise have been able to. ERP systems provide a comprehensive, centralized view of data. Picture this scenario: Lily, an HR Manager, comes to your site and fills out a form to get your free eBook on top HR software features. Now that she’s in your system, you need a way to maintain contact. Integrating your email app, such as Gmail or Outlook, and CRM platform gives you a central place to manage your communication with Lily and everyone else logged by your CRM. Gone are the days of double entry and leads slipping through the cracks because your process is too cumbersome. Automation: Cut out time-consuming tasks by automating things like follow-ups and responses. For example, you can set up a “welcome aboard” email to automatically go out to anyone who makes a purchase and becomes an official customer. Seamless tracking: Monitor your emails to pick out trends and create a process that best serves your customers and contacts. Quick access: Store your relevant sales info in a single location to make lead nurturing more efficient. The less time sales spends tracking down info and manually managing their tasks, the more time they have to qualify leads and bring in revenue. Getting leads into the sales pipeline is great. But it’s only the first step. Once you have their info, it’s time to start seeing who’s qualified. That’s where an integration with your calendar comes into play. The sales team needs to make calls, send invites, schedule meetings and generally manage interactions with potential customers. If your calendar and CRM are synced, that process becomes more straightforward. For example, Zoho CRM has a group calendar feature showing everyone’s availability. That avoids scheduling conflicts and keeps the sales team on the same page. The calendar also features direct calling, so your reps don’t spend time searching for a prospect’s number. Often, your email application comes with built-in calendar features, so if you integrate Outlook, for example, you’ll get the calendar capabilities too. Managing all your scheduling and communication becomes that much more efficient. Easily manage sales calls, demos and more with a calendar integration. Once you have customers, maintaining a positive relationship is critical. Enter integration between your CRM and customer support software, such as Zendesk. Your CRM houses a record of all your customer information, which is highly valuable to your help desk. Consistent data: The support team needs access to the right customer info to avoid any errors that will prolong the time it takes to solve an issue. Personalization: We’ve all had our share of frustrating support experiences. Imagine the difference it would make if, when you need a problem fixed, you feel that the person on the other end of the line understands you. When your CRM and support software are connected, that’s exactly the case. With full, quick access to a customer’s profile info, the support team can personalize each customer interaction. Automatic data population: When a current customer reaches out to the help desk, the info in your CRM transfers to the support software, eliminating duplicate entry and saving the support team time so they can focus on reaching a solution quickly. It also gives them key insights such as contact info and purchase history, which enables them to provide the best customer experience possible. Using a CRM is all about optimizing your marketing efforts, so why not go the extra mile? Integrating your CRM with social media channels helps track customer engagement along their journey. It may even help you find new leads. You can identify your most engaged customers, who may be good prospects for upselling or cross-selling. You can identify your least engaged customers, who may be good people to offer an incentive to. You can also automatically identify the people who aren’t customers but continually engage with your content. These are the kinds of people that become highly qualified leads. Social media and CRM integration enables more insight into your customers and audience. By engaging, they’ve showed their interest in your company, so you know there’s a good chance they’d be interested in using your product or service. After completing a social media and CRM integration, you can let the automation processes discover leads for you. An often overlooked benefit of social media and customer relationship management software integration is the ability to track the customer journey. Sharing data lets you uncover insights on how a customer started as a Twitter follower, engaged with your content and eventually adopted your services. This shows you what types of content are most effective, so you can produce more of what works. Alternatively, you may also discover that you generate very few customers from your social media channels. That’s still a win. You learn that you need to improve your social media strategy and have data to inform your efforts so your content starts grabbing attention and leading to action. So no matter what, you’re learning something valuable about your marketing. The benefits of integrating your CRM solution with your website mostly comes down to automation and reduced response times. One of your website’s biggest marketing features is the ability to generate leads through online forms. We’ve all gone to websites and seen those pop-ups asking for our email or longer forms offering a valuable piece of content in exchange for our name, contact info and favorite brand of ice cream (just kidding!). When someone downloads an offer, all the info they entered flows into your system. With the old method, after someone filled out a form, you had to manually enter that information into your CRM system to start tracking them. This isn’t the case when you integrate, as the system automatically enters information into that person’s profile — or creates a new profile — in your CRM database. Instantly capture things like name, email and company. In addition, as Annertech describes, you can greatly reduce response time to visitor queries. Following a form submission, whether it’s a request for a quote, a demo or simply a request for more information, the CRM automatically assigns the query to the right person or team. This allows your sales people to follow up quickly, rather than waiting around for someone to comb through each form submission and then assign the follow up. Research suggests that whichever vendor responds the quickest earns up to half of the sales. So a timely response can make the difference between a lead converting or becoming a lost opportunity — and quite possibly a customer for your competitor. Without getting too deep into the weeds, let’s run over some technical aspects of CRM software integration that will help make the process less daunting. First, it’s always a good idea to document the setup you put into place. Identify how the fields in each system map to each other and which system sits at the top of your hierarchy should you run into any data discrepancies between systems. Having this information laid out from the get-go will save you (or more likely, your IT department) a lot of headaches when you make changes. Another thing to keep in mind is that the built-in functionality of an integration package may not cover every piece of functionality you need. You may have to configure certain elements. Some setups let you drill down to the code and make customizations, which will require the expertise of your IT team. Also be aware that “data integration” isn’t a catchall term that refers to one method. There are several types of integration that each accomplish different things. They range from virtualization, which centralizes data from multiple systems into a single view, to consolidation, which aggregates data from multiple sources into a single location via ETL (extract, transform and load). No matter the complexity of your integration, you never want to run the risk of losing valuable data. You should always run backups before implementing changes, so you’ll have a master record on hand in case something goes haywire. If you use an integration platform, you can typically expect them to include this, but always be sure to check. Finally, consider how the vendor has designed the product for integration and what role they’ll play in the process. Some products have designated modules for integration, while in other cases you may need to turn to an iPaaS (integration-platform-as-a-service) solution. Before settling on which CRM you want, ask the vendor questions to get a clear idea of if or how they’ll support your integration. Compatibility issues: Your CRM and another system may not use the same format for individual text fields such date formats or contact names (first name only vs. first name and last name). So make sure you identify which ones don’t match up and choose a single format to use moving forward. If you don’t, when the two systems talk to each other, it’ll be like they’re speaking different languages. “Dirty” data (not to be confused with “The Dirty Dozen”): Chances are, some of your systems have outdated or inaccurate information, and that may also be the case for your CRM. If you don’t clean that data up before implementing your integration, it can cause lots of confusion, drain time and tie up resources as you backtrack to verify that everything is current and accurate. Lack of technical expertise: This is a people issue, and it’s a surprisingly common one, according to a recent survey. Make sure your company is equipped with the technical know-how to run an effective integration. If not, hire a third-party specialist to manage it for you. Otherwise, you’ll be like an accountant trying to program and launch a rocket — it’ll probably blow up in your face. No built-in feedback: There’s not much point integrating two systems if they don’t help the end users. The answer is to create prototypes. These let you get valuable feedback during the process, so you can adjust accordingly and not saddle your teams with connected software that’s less helpful and efficient than before. Lack of planning: Just because it works on paper doesn’t mean it’ll work in real life. In fact, you can almost be certain something will go wrong. It might be nothing more than some data issues you can quickly solve. Or your whole system might go down unexpectedly. In either case, it’s good to have a contingency plan. Be sure to backup your information and have a disaster recovery plan laid out in case something happens. API roadblocks: APIs (application programming interface) are handy for playing matchmaker between two software programs. Problem is, they don’t always provide complete integration, or the vendor might not offer the APIs you need. Software integration isn’t always the easiest thing in the world. But it’s well worth the effort. The more systems you integrate your CRM with, the less manual work you’ll need to put in. Plus, you’ll increase access for the people who need to use data, gain important insights, create greater efficiency through automation and manage the relationship with your customers more effectively. That said, any integration you implement will only be as effective as your CRM. Make sure you lay a solid foundation by getting the right system. Grab our free CRM requirements template to make a faster, smarter selection that guarantees you get a CRM that’s perfect for your needs. Which CRM integrations would benefit your company the most? Share your thoughts in the comments!